We make merchandising and vending of food products highly convenient and hygienic for you with our table top food bars. These food bars are available for tables of different sizes and available in attractive colors. Our table top food bars feature a solid construction that can easily withstand stress of moving from one place to another. They are very lightweight and are simple to use by the operators. 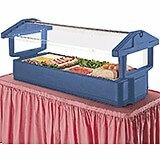 These economically priced food vending equipment facilitate double sided serving of the food and they have sneeze guards on both the sides of the bar. All the offerings are equipped with insulated walls and drain plug. 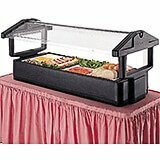 Select models of these table top food bars come with thick foam ice well that can keep ice intact for a long time in order to keep salads, condiments and dressings fresh.